First of all, I have to say thank you to one of my colleagues, Soren, to share this Exchange troubleshooting skill for this case. 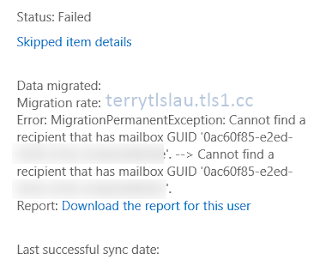 The symptom is when you move a mailbox from Office 365 to an on-premises by Exchange Management Console (EMC) or Exchange Admin Center (EAC), you get the following error messages. "MigrationPermanentException: Cannot find a recipient that has mailbox GUID <GUID>"
We need to set the same GUID for this mailbox. However, the Exchange GUID of the mailbox is the same between Office 365 and on-premises Exchange. We need to check the remote mailbox function of this user account is enabled or not on the on-premises Exchange server. How can we verify it? Perform Get-RemoteMailbox <Alias> on the Exchange Management Shell of the on-premises Exchange server. Then, what do we need to do? Perform Enable-RemoteMailbox <Alias> -RemoteRoutingAddress <Alias>@<accountName>.mail.onmicrosoft.com to enable remote mailbox for this user account. Then, we need to set the ExchangeGuid for the mailbox. If there is an archive for this mailbox on Office 365, we also need to set the ArchiveGuid. Then, copy the ExchangeGUID and the ArchiveGUID of the user mailbox. Back to the Exchange Management Shell of the on-premises Exchange server. Perform Set-RemoteMailbox <Alias> -ExchangeGUID <Copy from Office365 Exchange GUID> -ArchiveGUID <Copy from Office365 Archive GUID> to assign the same Exchange GUID and Archive GUID to the user mailbox. As this time, you can try to migrate the mailbox again.